Ned Rozell | Geophysical Institute Apr 5, 2019. Iditarod is a lonely place. A century ago, for a few years, it was the largest city in Interior Alaska. Photo 2: A travel trunk on the tundra in the ghost town of Iditarod. Photo 3: A vault with walls two feet thick that was inside an Iditarod bank. Photo 4: The Mitchell Hotel in Iditarod, where travelers slept in the early decades of the 1900s. 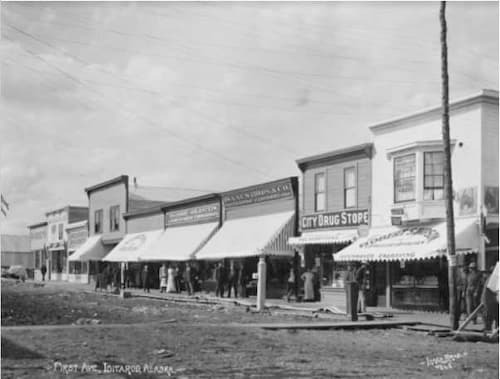 Image-First Avenue in the town of Iditarod around its peak in 1911. Lomen Brothers photo, UAF Archives.